Welcome to the third post of day two! Martin Smith and John Becker: bestselling authors with ordinary names and extraordinary minds. Rivals since childhood, they live in the same town and are famous for their uncanny similarity in physical manner and literary voice. When one of them ends up dead at the other's home, an investigation is launched into their dark past, revealing a series of troubling stories from their childhood, adolescence and careers, throughout which lurks the presence of an authorial entity with roots beyond our time or dimension – a sinister entity with far-reaching designs. It was at the tender age of 7 that an interconnection of cells and organs called Mike Robinson (then Mikey) penned, or pencilled, his first story. Called "Aliens In My Backyard! ", it went on to become a runaway bestseller, topping international charts (or maybe that just happened in his imagination, too). "Skunk Ape Semester", his debut novel, was released early 2012 by Solstice Publishing and was a Finalist in the Next Generation Indie Book Awards. 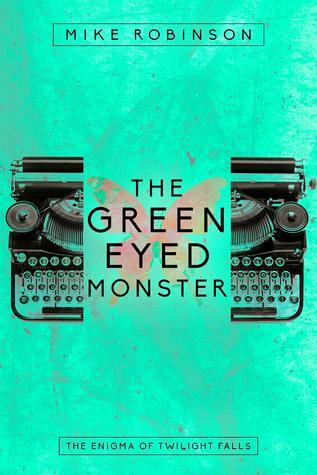 His follow-up, the supernatural mystery novel "The Green-Eyed Monster", debuted October 2012 from Curiosity Quills Press. His existential horror novel "The Prince of Earth" is also available. Right within the first few pages of this story Martin has shot and killed John. The question is WHY!? It really worked to draw me in as a reader. I was intrigued to figure out the mystery! This story was a true blend of a ton of different genres its not just one. Mystery, Horror, and some science fiction all play a part in this story what will surely knock your socks off and make your head spin. It was a very crazy out there ride that I just couldn't put down. I really loved how the story played out within the backstory of the two boys and the weaving of the characters and plot. If you love this kind of book this is def. one that I would pick up it won't do you wrong!